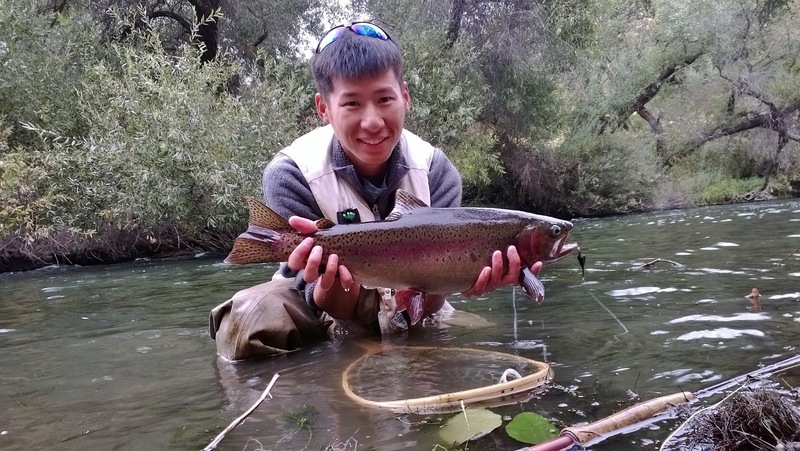 Keep Calm and Fly Fish: A Wild Putah Creek Beast Appears! Despite feeling a little sick, I took advantage of the overcast weather conditions and set out for Putah Creek. The flows are currently dropping and were at 270 CFS when I last checked. 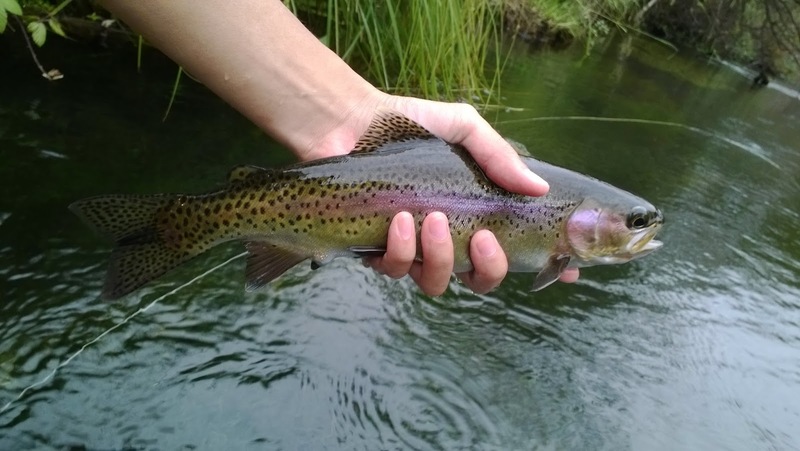 Although I was more curious about how the creek looked and fished at these flows, I was pleasantly surprised when I finally hooked and landed my first Putah Creek beastie! Low-light, cold water, and lowered flows; it was feeding time on Putah Creek. The fish were very aggressive and chased my Hero Sculpin in nearly every access spot. Although I didn't get very many sticks, I was able to land two this trip while losing only one. These bows are experts at throwing hooks. Most of the fish in the creek are between 8'' - 14'' which might have played a factor in them not sticking. I was using a size 4 hook which might have been too big for these guys. I'll try tying my streamers with a smaller hook to see if it makes a difference. I currently know four spots that hold big fish. How do I know that there are big fish in these particular spots? Well I've either seen them, caught them, or hooked them on a consistent basis. As a matter of fact I've even named them because I'm pretty sure I'm encountering the same fish. Today I finally caught Bucky. Bucky lives in a deep run/pool. I've had him follow my streamer once before only to have him see me and refuse. After that encounter, I threw several different presentations to try and entice him but he was spooked and I moved on. Today I found him in the faster water towards the head of the rapids. Not expecting that I'd find him there, my line suddenly tightened. I knew I had hooked him. His dark red sides flashed as he raced upstream into the deeper water. There was no way I was going to land him in the faster water so I had to carefully maneuver around the fallen branches, blackberry thorns, and slippery rocks all while keeping a tight line. Once I made my way to the slower water, I fought Bucky for a few more runs and finally netted him. After taking a few pictures, I let Bucky recover and swim free hoping to one day catch him again. There is truly something special about these Putah Creek bows. 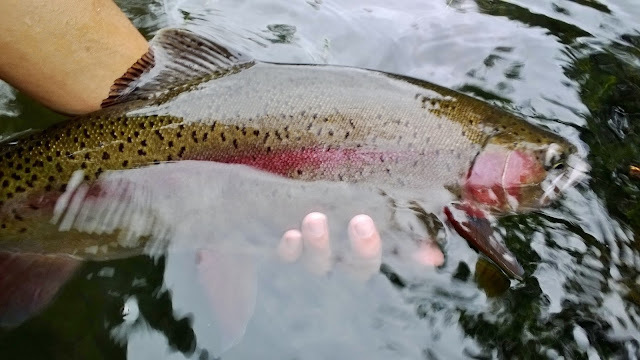 Their unique morphology sets them apart from any other wild rainbows I've caught in California.